It&apos;s safe to say that Star Wars: The Old Republic is the most anticipated MMO currently in development. Its December 20 launch date is getting tantalizingly close, but thousands of players are checking their email inboxes daily waiting for their chance to get their Force on in the closed beta test. 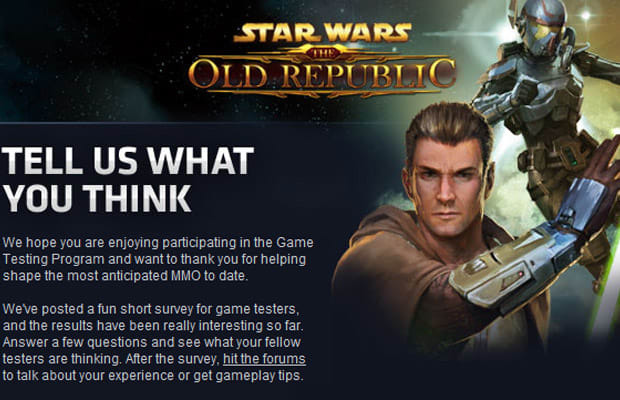 Late last week, thousands of gamers were elated to find an email mentioning the SWTOR beta, but after they read it, confusion set in as it was a survey asking them how they enjoyed the game&apos;s beta test. BioWare&apos;s forums exploded with questions and complaints and the incessant nerd rage temporarily overloaded the site. An apology was issued from BioWare admitting that the emails were sent in error and we&apos;re sure those who are responsible will be frozen in carbonite and put on display.